Its goal was to simplify the complex processes of license management and distribution of digital content by offering a registry of rights and licenses on an open, transparent and universal blockchain ledger. In the first post, I have describes the approach for content identification the Content Blockchain Project has pursued in the past months. In this second of two posts, I would like to describe the approach for license management that the Content Blockchain Project has pursued in the past months. It addresses stakeholders in the media industry with a non-technical and non-legal introduction to two elements that we the developed in the project: the ISCC content identifier and Smart Licenses for digital media. Please consider the approach as a proposal. We very much appreciate any kind of feedback. Just like the ISCC unequivocally and inseparably links any specific content to a specific ID, the Smart License unequivocally and inseparably links a specific content to its associated license terms (one or multiple licenses), respectively links specific license terms to a specific content. This means that effectively anyone with access to the content will also have access to the license terms of the content, if registered on the Content Blockchain. This is a revolution in digital media publishing. The term “Smart License” should not be confused with a “Smart Contract”. A Smart License is not a technical ‘protocol intended to digitally facilitate, verify, or enforce the negotiation or performance of a contract’. Smart Licenses are legal representations that will allow rights owners a simple means to offer and trade content globally in a secure and reliable, open and transparent, automated and machine-readable way on the Content Blockchain. Accordingly, Smart Licenses will offer intermediaries, retailers and users easy access to content licenses and a way to verify and purchase them in a simple and potentially automated manner. Smart licenses are formulated in such a way that they are easy to understand and can be used by everyone. Using the Smart License generator starts by selecting a Smart License template that defines the scope of the Smart License, i.e. the rights to use the licensed content. Together with some standard clauses, obligations and optional restrictions the Smart License forms the offer for a license agreement. For each content type (text, image, audio, video), media format and business model, an individual Smart License template could be generated, e.g. a Smart License template for B2C transactions for news media images, or a Smart License template for B2B transactions for e-books, etc. The text of the Content Blockchain Smart License Templates (created by the Content Blockchain Project) is dedicated to the public domain under the CC0 Public Domain Dedication. It is further intended to create a repository of Smart License templates that can — depending on the license — be licensed or used freely for any kind of transaction model. The general terms and conditions. All components of the Smart License template contain legal definitions in the form of human readable text, just like the final result of the process of creating a Smart License will be a human readable license agreement. This way, smart licenses are comprehensible for anyone, including laypersons, not only machines or lawyers. After the decision for a suitable Smart License template for a specific business case is made, rights owners and licensors can choose from a limited number of rights modules and license conditions that define the granted use for the respective digital media content. Obligations: Attribution, fair share, indicate adaptations. The combination of the selected rights modules and license conditions, depending on the Smart License template, will create a rights profile for a Smart License. Please note, the difference between Smart Licenses and Rights Markup Languages: RML try to describe a standard to express rights, rules, and conditions that are suitable for a broad range of licensing transactions, whereas the a Smart License covers a individual regulation requirement for a specific use case. A Smart License template could as well include elements of rights markup languages like ODRL or ONIX-PL or Rights or other established standards. Supplemented by general regulations, like the disclaimers and standard terms and conditions from the Smart License template, possible variable license terms as well as additional elements like the price per license, the rights profile will constitute the content of the Smart License in form of a JSON data structure. General legal definitions of the specific license agreement as specified by the Smart License template. Per definition and from a legal point of view, the Smart License is an offer to conclude a license contract, that contains all necessary aspects in this regard. The licensee can accept the offer by performing an act that the licensor has defined as a declaration of acceptance, e.g. a payment on the Content Blockchain. The Smart License generator will create a human readable text version of the license agreement from all components of the Smart License as well as a JSON data file, that will include the specific values (e.g. the legal content) of all components in a machine-readable way. The JSON data file will be the technical representation of the license agreement. Additionally, a random unique identifier, a UUID4 string (an example: f846a304–158b-44cf-8c1b-f8e3ce8092f4) will be created. It will designate the individual Smart License. Both, the UUID4 string and the JSON data file allow to re-create any individual license agreement in a human-readable text. The details of the transaction that generated the stream item. Registering a Smart License is a transaction on the Content Blockchain. As the ‘Smart License stream’ on the Content Blockchain is a public stream, any application can search the blockchain for an ISCC or an UUID4 key to get access to the license terms of a specific content offering — in a machine-readable way as well as in a human-readable text. Reconsidering the process from the beginning, i.e. creating and registering an ISCC content identifier to this current step, i.e. 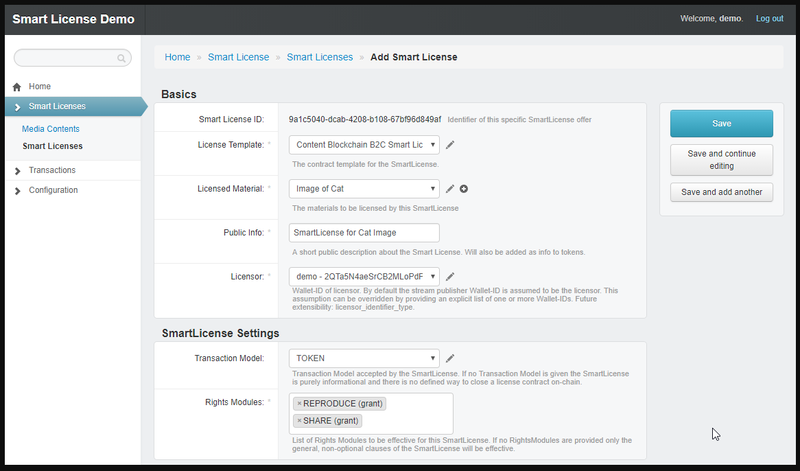 creating and registering a Smart License on the Content Blockchain, this means not only that anyone with access to the content will be able to generate the same ISCC from the content itself and to unambiguously identify the content but also that anyone with access to the content can find out about the license terms of the content, provided that — of course — the rights owner has registered Smart Licenses for the content on the Content Blockchain. Depending on the content type and business case, more than one Smart License can be registered for one ISCC, i.e. for one specific content. In these scenarios, different Smart License templates would apply. E.g. an e-book could be offered directly to consumers or to an intermediary or retailer. Please note that a Smart License may constitute a public license offering when it is publicly registered on the Content Blockchain. However, it is not in all business cases that the preferred scenario includes the feature to find the license terms publicly accessible on a public blockchain. To support a scenario with restricted access to the content of the Smart License, in future releases, it will be possible to create a targeted license offering through a Confidential Smart License. With a Confidential Smart License, it will not be the plain JSON data file that is published in the ‘Smart License stream’, but rather a hash across the previously created JSON data file. This will guarantee the integrity of the license and anchor it on the public blockchain ledger. But the exchange about the content of the Smart License remains to happen bilaterally. Governance, permissions and rights owner identification are essential subjects of the discussions and further development within the Content Blockchain Project. These aspects are crucial to protect intellectual property rights and prevent their abuse by means of the Content Blockchain. As data streams on the Content Blockchain are either entirely open for reading and writing or curated and permissioned, the following questions are among those that need to be addressed and will become part of the overall governance regulations of the Content Blockchain: Who will get the permission to open data streams? What are the requirements for running a stream and writing in a stream on the Content Blockchain? How can a blockchain, that is in principle considered to be open, manage and govern data streams? Please note that the content itself is not stored on the blockchain and that content access authorization is managed by blockchain-external applications that can define their own trust-rules. On the other hand, the act of publishing a Smart License could implicitly be understood as an unverified and illegitimate claim of ownership for the respective content. Reputational scoring based on chain history.